Although most pulse products are sold to either protect expensive electrical equipment or provide additional outputs, they can also solve tricky challenges in pulse metering applications. Specialized pulse solutions have become an area of expertise for Solid State Instruments in our efforts to satisfy our customer’s pulse-related needs. Totalizers are incredibly useful products that can be helpful in many types of applications. Their basic function is to take multiple inputs of pulse information, totalize them, and then send the totalized pulse data out to one or two endpoint receiving devices. 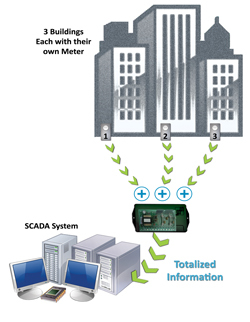 Typical applications include interfacing between meters and customer-owned energy management equipment such as a demand control system, SCADA system, or a recorder. Totalizers don’t just add pulses together, they can also calculate net energy use by using both positive and negative pulse input values. For example, in applications where energy is being generated while simultaneously being used to power certain aspects of the configuration, the customer may want to “net” out the amount of energy used. An electrical provider has 3 Wind Turbines on site used to generate power for the Distribution System. However, in the process of sending the power downstream to the Distribution System, the Substation uses a small percentage of that power for operating tasks, such as lighting, control systems, etc. 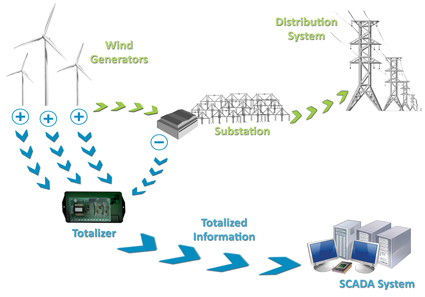 The totalizer takes the pulse inputs from each of the 3 wind turbines, sums them, and subtracts the energy consumed for operating the substation. This will provide the customer with the total “net” energy produced and delivered after taking the substations energy consumption into account. There are many types of applications where these types of configurations are needed and can be executed with the use of a Metering Pulse Totalizer. Click on the models below to learn more about their capabilities. Pulse Links are used in situations where it is difficult to get pulse information from the meter’s location to where the output pulses are needed. In other words, you need to get pulses from Point A to Point B, but the distance is either too great or there is some sort of barrier making it impractical or expensive to use standard equipment. Fortunately, SSI provides several types of Pulse Link Products, making it possible to achieve this goal through whichever medium is best for your specific situation. 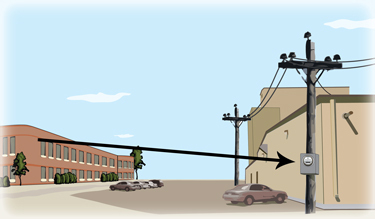 The PRL-900 can wirelessly transmit a pulse signal up to a distance of 1000 feet. It is equipped with 4 channels capable of operating in Form A or C. Great in applications where running wire is expensive or not feasible. The OPL can transmit a pulse signal up to a distance of 3 miles through multimode fiber optic cable. It is available in 1, 2, or 4 channels capable of operating in either Form A or C.
* Also available in single-mode fiber for distance up to 18 miles. The TT-4C Transmitter and TR-4C Receiver use a DTMF (duel-tone, multi-frequency) signal to transmit up to a distance of a half mile through either an existing dedicated phone wire or alternative twisted pair wire. It is equipped with 4 channels capable of operating in either Form A or C.
The PTR-1PS Transmitter and CLR Receiver transmit up to a distance of 2-4 miles (depending on the receiver model and wire size). All units operate in Form C, and the CLR Receivers are available in 1, 2, or 3 outputs. The PTR-2PS is installed near the pulse-receiving device and receives the pulse signal from the meter through a pair of wires up to a distance of 2,500 feet from the meter. It is equipped with up to 3 Form A outputs. Pulse Conditioning Relays are used in special situations to filter out any electrical disruptions (also referred to as “noise”) that may disrupt or be mistaken as a pulse. Pulses occur in specified time durations. Whether the pulses are in normal mode (inputs and outputs have the same time duration) or fixed mode (output time is fixed regardless of the input pulse duration) the conditioning relay will filter noise and transients at its input to prevent any false pulses at its output. This is achieved by setting the relay to ignore anything that is not within its specified time range. If used in a very noisy environment, the pulse acceptance window can be lengthened or shortened. The diagram above demonstrates the opening and closing of a relay contact. Even though the noise spikes have sufficient enough voltage to close the contact, they are rejected from the pulse count because the length of time they each occur does not meet the pulse acceptance window. In other words, the pulse width of each noise spike is too short so they are ignored. Click on the models below to learn more about their capabilities. If you ever come across a "tricky" pulse metering situation, contact the experts at Solid State Instruments... We may have just the solution you're looking for!